The third Stratospheric Aerosol and Gas Experiment (SAGE III) Meteor-3M was the EOS component of the Russian Meteor-3M mission. SAGE III provided accurate, long-term measurements of ozone, aerosols, water vapor, and other key parameters of Earth's atmosphere. Due to a power supply system failure, communication with the satellite was lost on March 6, 2006 and the SAGE III and Meteor-3M missions were terminated. 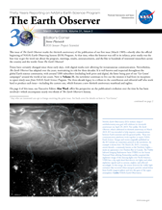 SAGE III provided global, long-term measurements of key components of Earth's atmosphere. It also provided measurements of temperature in the stratosphere and mesosphere. Through profiles of trace gases, such as water vapor and nitrogen dioxide, SAGE III investigated the significant role of these gases in atmospheric radiative and chemical processes.